This week was a long one, but the weekend is here, and we've got a good bit of R+R on the agenda. Now, time for a little FoF! Can I just profess my love for Zulily? I've been ordering left and right from this awesome sale site recently. Sure, it has kid and baby stuff, but don't go thinking it's only for mamas. I've also purchased home decor and my favorite Philosophy face products from it before! Signing up is free, and here is an invitation link that you can use to join if you'd like. Yes, you do get a daily email of the sales going on (you can opt out of them though), and yes, you can save major moolah through this site. Here are some of the items for Baby Girl I've ordered most recently. 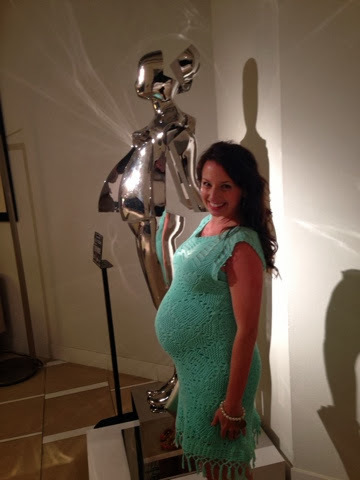 Thanks for all of the love on my baby shower dress! 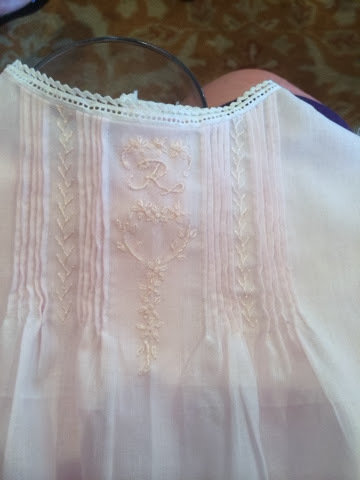 I wanted to share some details on this pretty frock. 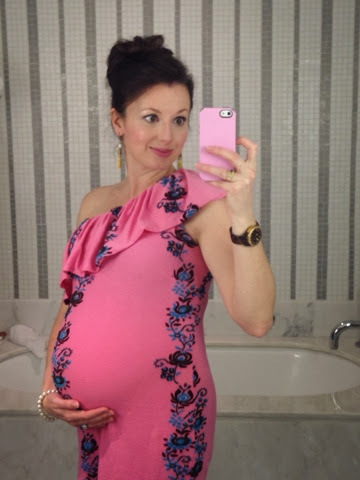 It is from PinkBlush Maternity and I swear it's as comfy as pajamas. I was really impressed with this site and their prices. Good news for y'all, I have a giveaway planned for next week from this awesome line! I posted about this already on Instagram, but CHEERS to the fact that this past week was my very last overnight trip for work! They have graciously allowed me to continue working my job upon my return but without the travel portion. I'll have an occasional day trip, but no more hotels for this girl! I snapped this photo on the way out of the hotel the other morning ... so long, farewell! 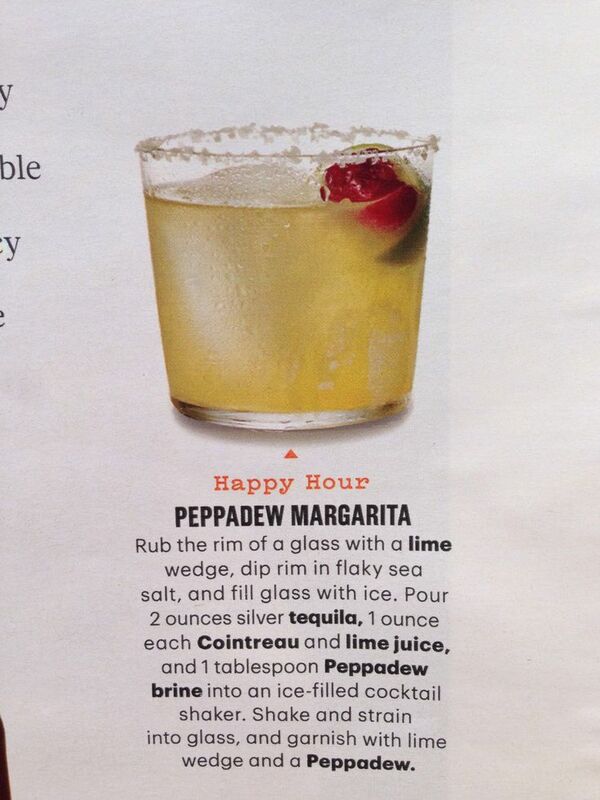 So obviously I haven't been knocking back the hard liquor recently, but I saw this recipe for a peppadew margarita in my most recent Real Simple magazine and I snapped a photo to add to my Pinterest cocktail board. 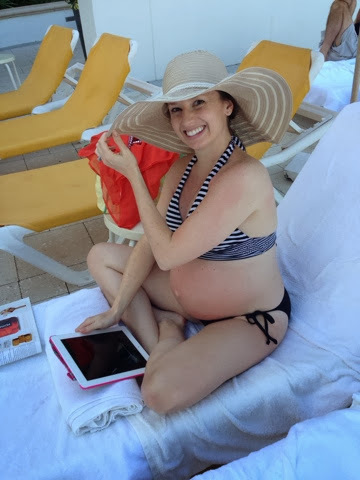 Since baby girl is due on Cinco de Mayo, I'm not counting out the chance just yet that I may go a smidge early enough to celebrate her birth with a REAL margarita! This one would easily be my choice. Love this great reminder. 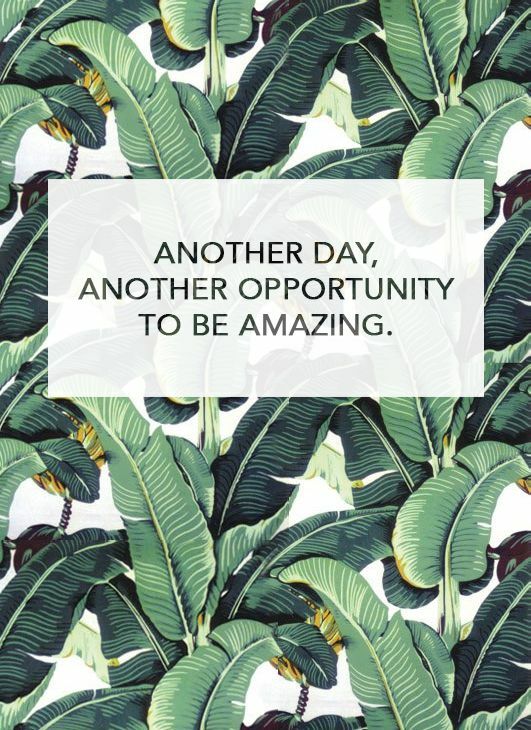 Make it a great day ... happy Friday, y'all! 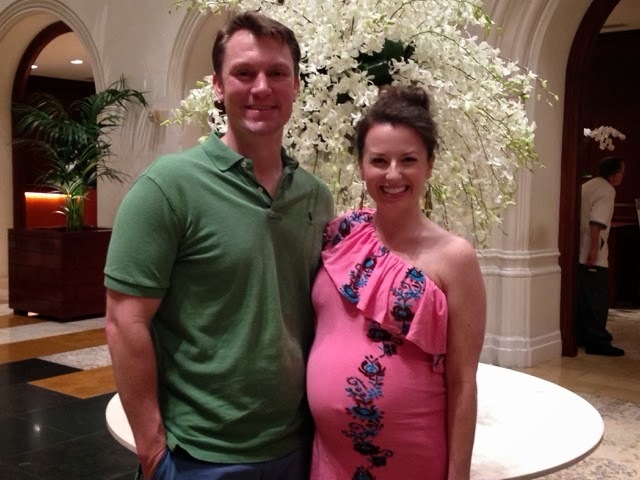 Last Wednesday couldn't have started off any better: I received a call from my doctor around 7:30am confirming that my repeat glucose test was normal! 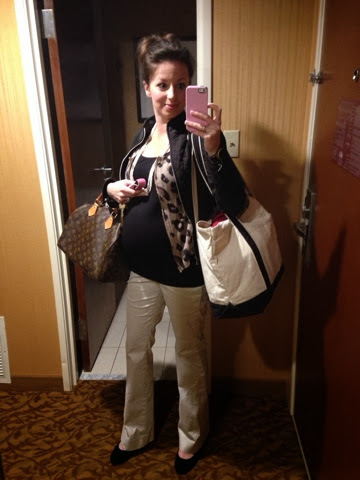 This was the very day we were leaving for our Florida babymoon, so I was completely relieved. 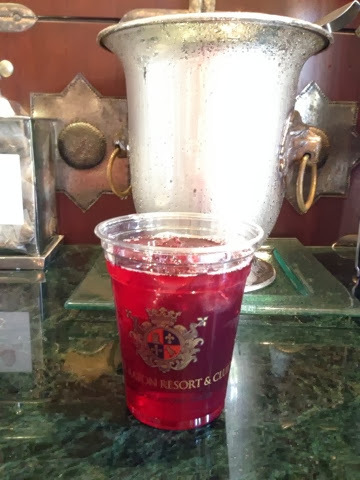 Had the test results been abnormal, I would have just handled it as best as I could, but it was definitely a joyous moment to know I was in the clear to eat, drink, and be merry on our trip! 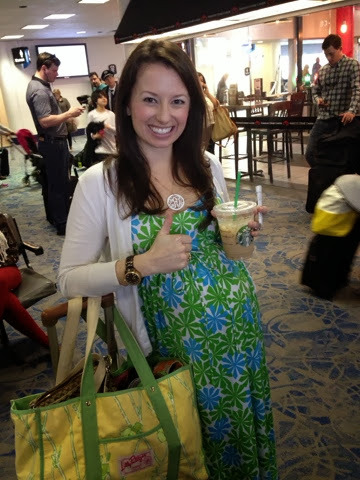 As soon as we arrived to the airport, we hit up Starbucks and headed to the gate. 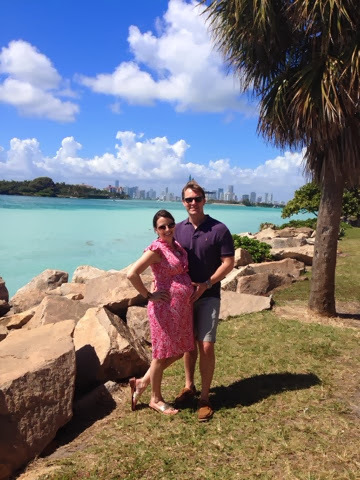 We flew in and out of Miami, but our first destination was Boca Raton -- specifically, the Boca Beach Club. 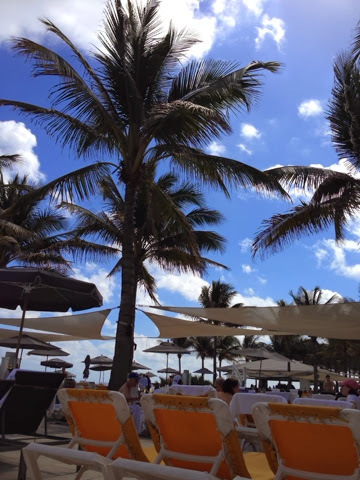 This Waldorf Astoria hotel is located right on the beach and has three pools. The service was impeccable. 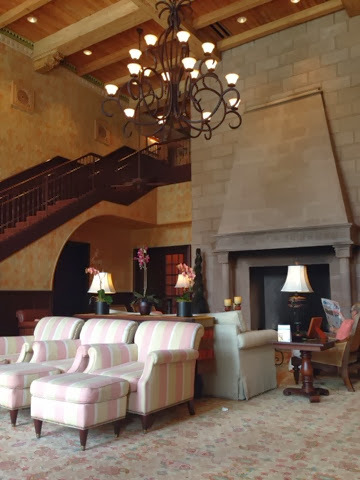 Another huge plus (and a big reason why we booked in Boca) is that there is a sister Waldorf Astoria hotel just five minutes away, the Boca Raton Resort & Club, and by staying at one, you have access to both. 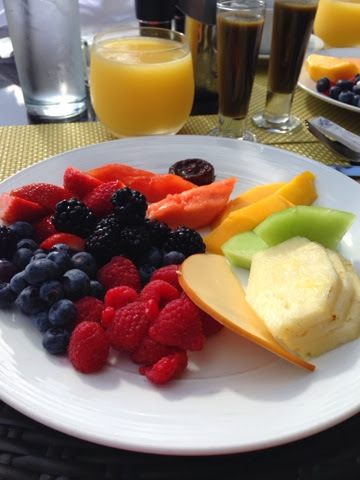 All three days that we were in Boca, we hopped the quick shuttle over to the sister site for meals and the spa. We took the Tri-Rail train from Miami to Boca Raton. It took about an hour and was less than $20 for both of us, round-trip! It was not the most glamorous ride, but we saved a lot of money (no rental car fees) and also the hassle of having to deal with traffic. 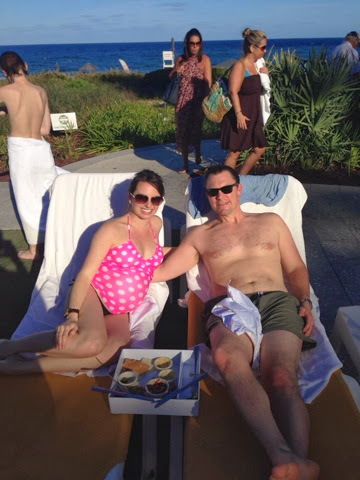 As soon as we arrived to the resort around 3:00, we checked in and suited up to hit the pool! 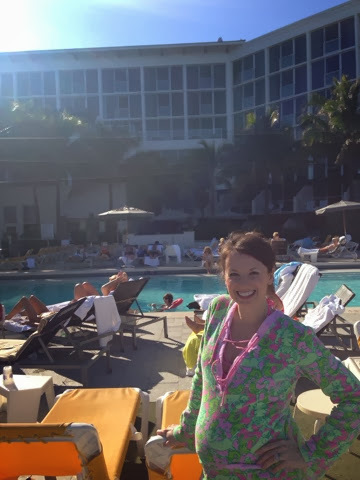 Before we left, I purchased my "mommy suit" which is just a tankini top. 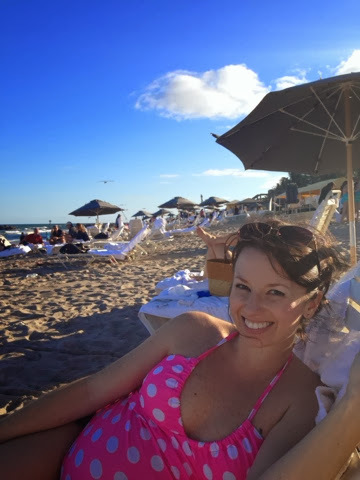 I also brought some bikinis, but I thought I'd ease the fellow vacationers into the tummy by going with the tankini on day one, HA. 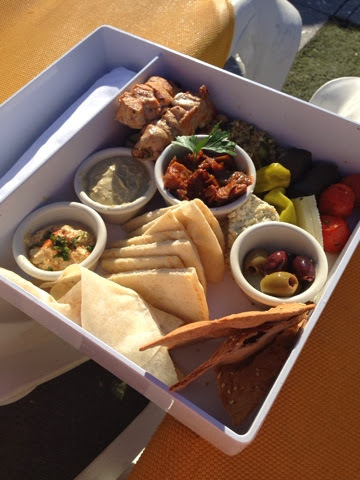 As a late lunch, we split this amazing Mediterranean bento box poolside. I could eat this type of lunch every single day of my life. 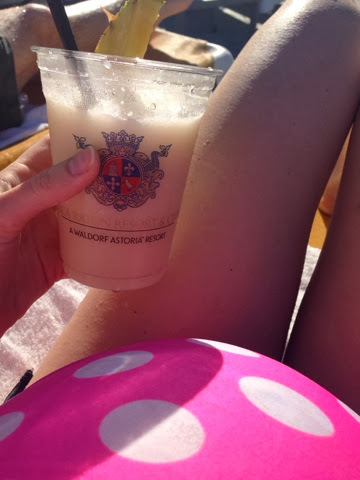 And later we enjoyed some drinks -- a virgin pina colada was my beverage of choice! We ended each afternoon out at the beach after the sun dropped down behind the hotel. That evening we headed to the sister resort for dinner at Lucca -- a wonderful Italian restaurant. The marina was right there and the boats were amazing! 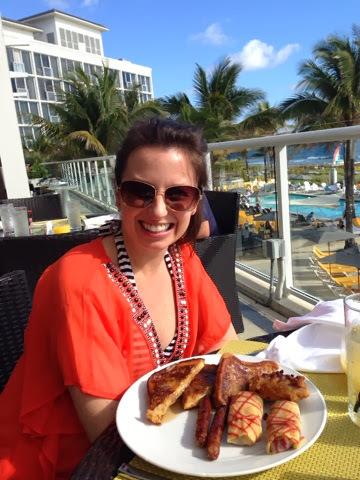 ... followed by French toast, sausage, a pastry, and crepes. Not messing around. 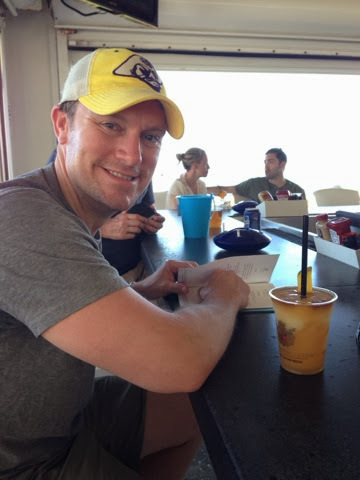 I stuck to my virgin pina coladas, but check out the rum floater that the bartender put on Ian's drink! 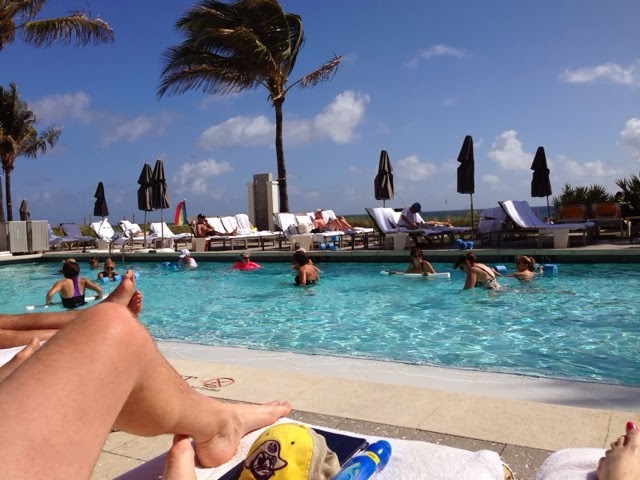 While we relaxed poolside, I finished reading one book (The Husband's Secret) and started on another (Eleanor & Park). 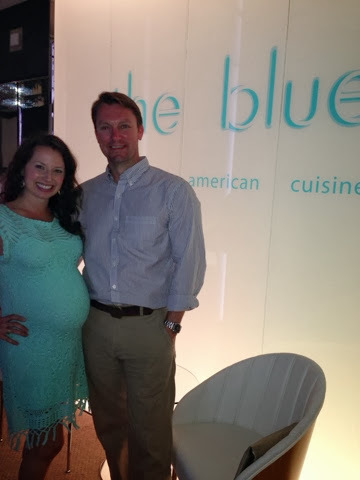 That night we had dinner reservations at The Blue, which is on the 27th floor at the Boca Raton Resort & Club. Dinner was fantastic as was the service. Ian had the most delicious looking raw oysters from the raw bar ... oh, how I miss those! We saw this statue on the way out and he said her profile looked like mine :) I totally have her beat, though. 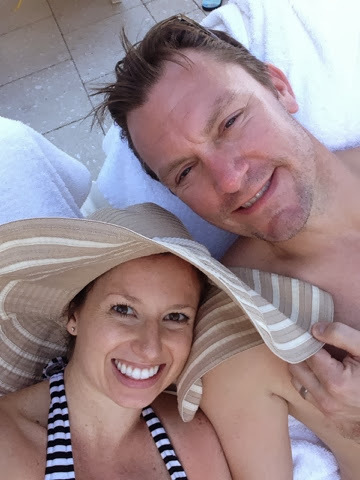 We spent our last day at the pool before heading over to the spa for 3:00 appointments. 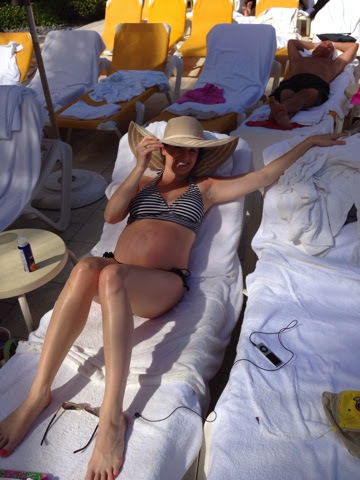 Ian treated me to the most delightful maternity massage, and the masseuse was amazing. Just by looking at me, she asked me if I was having a girl and if I was seven months along. She was GOOD. Also, she had a bed that had a hole cut out for my tummy. In seven months, I haven't been able to lay on my tummy, so this was divine! The spa was just breathtaking. This is the room where you wait for them to come pick you up for your appointment. 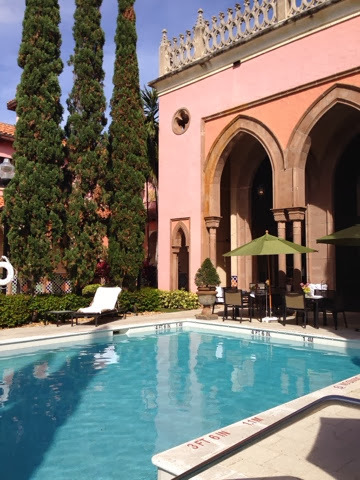 There was a private pool outside just for spa-goers. Relaxed and pampered, we cabbed it back to the Tri-Rail and headed down to Miami, where my best friend and college roommate Ashley picked us up and took us to their beautiful home in Coral Gables. We double-dated that night at Bulla and had the most awesome tapas. 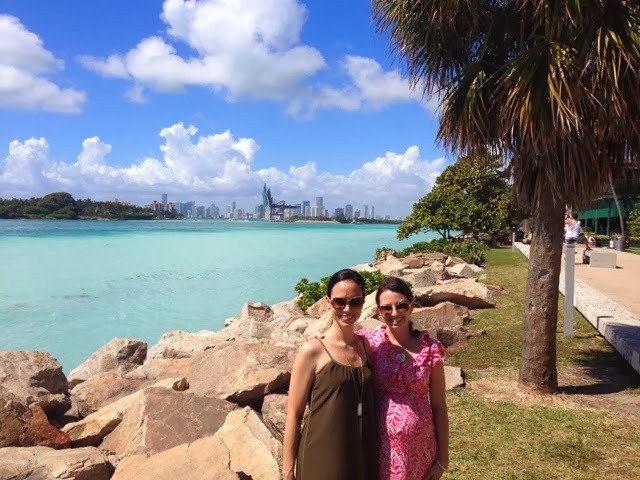 The next day we drove to South Beach and had brunch. After some amazing French toast, we walked all over and visited Pier Park. We flew back on Saturday, a little more tan and a whole lot more relaxed than when we left. Still to this day we are talking about how wonderful that getaway was. Good for the soul. 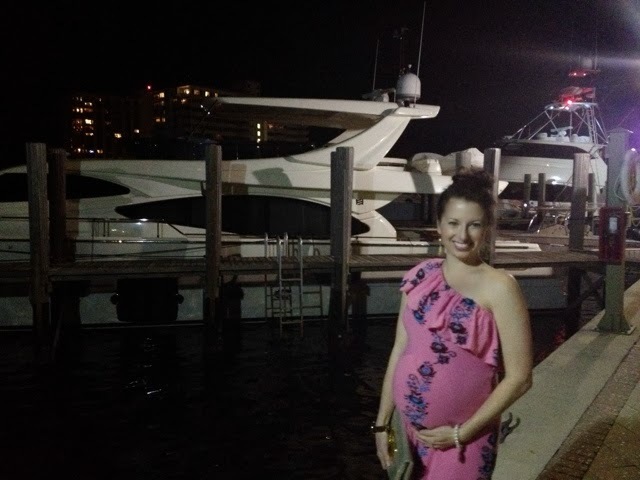 And the last big hurrah before we are a family of three! This Sunday afternoon I had the absolute best day celebrating our sweet pea's arrival! My girlfriends put on an absolutely beautiful baby shower for me, and I can't tell you how grateful I am to have such thoughtful and supportive women in my life. Baby R is going to have a pretty awesome set of aunties who love her! The shower was set at a girlfriend's house that just looked lovely. The hostesses did such an amazing job with the decor and food. The girls had some fun activities set up for everyone to partake in. I loved their creative ideas! It was also so much fun to open the gifts for our little gal. She was gifted some amazing presents and I think even the neighbors could hear the collective "oohing" and "aahing" at the adorable outfits and blankies! The below gift was such a special one ... my mom handmade a soft, baby pink gown for our daughter to come home in from the hospital. This embroidered gown was made completely by hand -- no machine stitching -- and it brought me to tears. I just can't believe how much love and time she poured into each stitch. There is even an R for our last name embroidered at the top. A true labor of love. I want to cry again thinking about it! My hostesses spoiled us with the crib mattress and organic, soft bedding. Plus a mermaid Blabla doll that is just the cutest! Here I am with most all of the hostesses (one had a travel delay home from Mexico so was unable to make it, but she put together a ton of the fun decor ideas, including the diaper wreath on the door). Love these girls. Even the baby daddy came by to make an appearance, thank everyone for being so loving and supportive, and help to haul the goodies home! 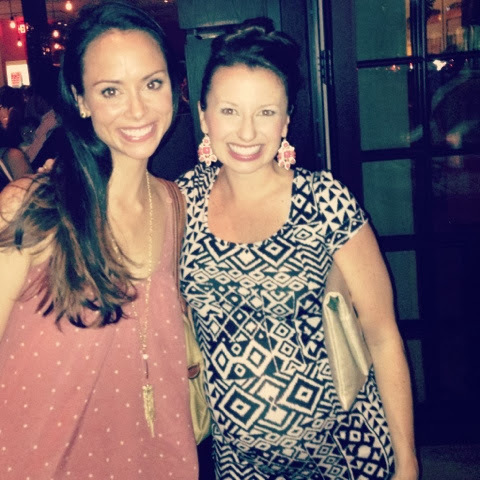 I loved having my sister Laura in town for this. She is going to be one cool aunt. 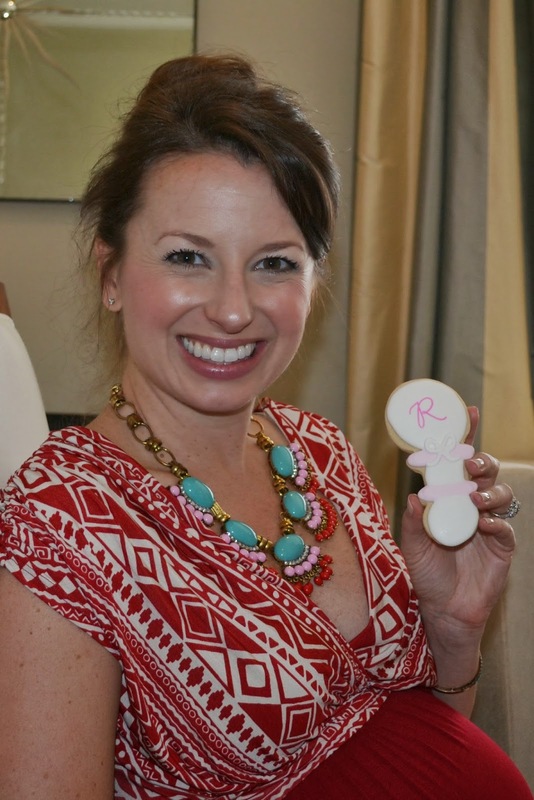 She and her husband already love Baby R so very much! Here I am with the grandmothers. I loved showing off the nursery to them! As a gift to everyone who came, the hostesses had small potted pansies in yellow and purple. It was the sweetest idea! I don't even know if they know this, but I have always loved pansies and used to collect anything with pansies on it as a little girl. Back at home, I got a real giggle seeing the diapers that people had signed. We have decided to go with The Honest Company for our diapering. And this diaper wreath is now hanging from baby girl's nursery door! To thank my sweet hostesses, I gave them an Essie nail polish in pale pink and a Sofia champagne. Because who doesn't love pretty nails and champagne out of a straw?! Thank you for letting me share this special day with you, and thank you again to the most FAB girlfriends ever who really know how to spoil a little girl and her mama-to-be!